Cleaning is absolutely essential within pharmaceutical production, by health and safety guidelines, human well-being and by law. You must prove acceptability of the cleaning procedure in place. 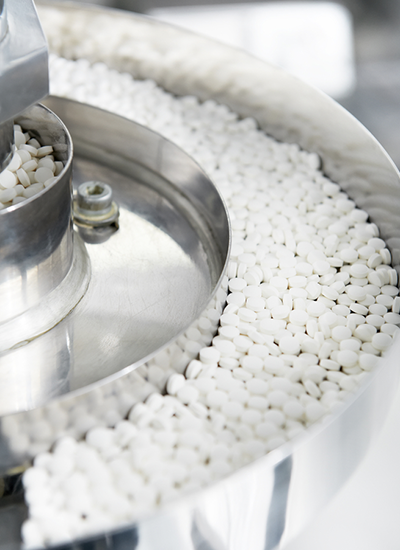 Deposits of expensive powders and cross contamination within Dryers, reaction vessels and Blenders present a real problem for Pharmaceutical manufacturers. Cross-contamination is strictly prohibited by Good Manufacturing Practice (GMP) regulations. Additionally, within the pharmaceutical industry you must prove that cleaning processes have removed residues to a sufficient degree. Acoustic Cleaners can prevent powder build up and ensure complete material evacuation. Where the introduction of any air in to the system is forbidden, Primasonics Acoustic Cleaners can be either powered by nitrogen or electrical powered wave generators. The pharmaceutical industry follows incredibly strict hygiene regulations to maintain high levels of safety and prevent cross-contamination. It comes as no surprise that the production environments are highly controlled and high-quality cleaning practices are of the highest priority within the sector. 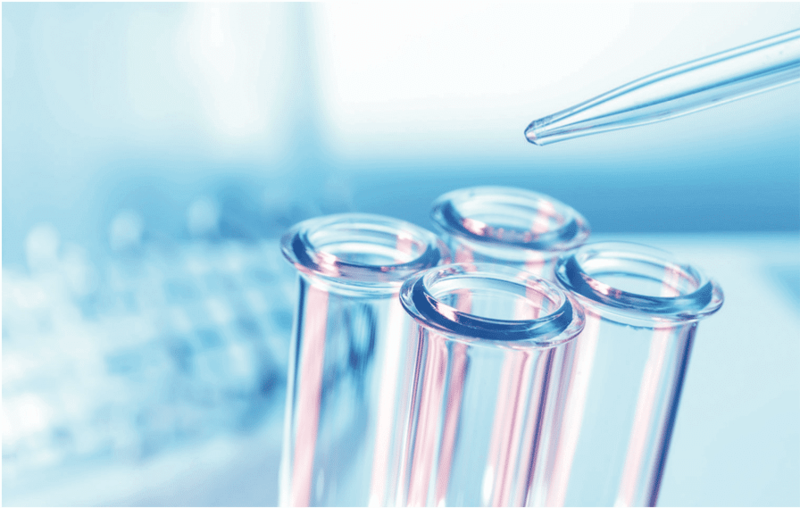 Cleaning validation is a critical aspect of quality control whereby labs must successfully remove all forms of active pharmaceutical residues and microbial contamination to ensure safety. By law, pharmaceutical firms must provide documented evidence that cleaning methods implemented in a lab fully control for carry-over of products including intermediates and impurities. Additionally, it is a legal requirement for your lab to be inspected by authorities which has been in effect since 1992; therefore maintaining pristine levels of hygiene is essential for the welfare of your firm as well as the wellbeing of your staff and patients. Cross-contamination is deadly serious within the pharmaceutical industry and MUST be controlled at all costs. Unfortunately, due to the nature of production some residue may still remain following manufacture, which is where structured cleaning processes come into effect and cleaning validation manuals must be stringently followed. You can very easily have products removed from the market even if you cannot confidently prove your products are not cross-contaminated, so implementing additional cleaning measures not only boosts productivity of your firm but also promotes your firm’s security. The last thing you want is product recalls which will damage your reputation. It is incredibly expensive and time consuming producing pharmaceutical goods, so ensure you have the best quality cleaning validation in place. We can support your valid analytical cleaning methods with the installation of our acoustic cleaners. Engineer out potential contamination complications with our top-of-the-range cleaning solutions or simply just improve on your existing satisfactory cleaning methods for due diligence. How clean is your Pharmaceutical lab? Expert’s believe in-lab inspections are not up to par and more often than not they are poorly conducted. Therefore you may need more cleaning measures put in place than you initially thought. Equally, you may simply want to avoid any cleaning failures all together with additional procedures being put into place - especially when being examined by authorities. Our acoustic cleaning range is the ideal answer to both of these problems. Generally within the pharmaceutical industry it is good to avoid manual cleaning completely if possible. Pharmaceutical cleaning methods are heavily proceduralized, however, having two people manually clean a lab to the same extent is not easy no matter how detailed your written documentation requirements are. The addition of further measures may bring you a step closer in promoting consistency. If possible, design your lab to circumvent manual cleaning entirely and plan your lab changes from inspection feedbacks to meet the definition of cleaning validation. Most importantly, visit your lab yourself and evaluate the cleaning procedures put in place and assess whether you need the installation of additional measures. Talk to your employees to find out how up-to-scratch they believe the current cleaning methods are. If you do decide to use us and install Primasonics acoustic cleaning products within your pharmaceutical lab, make sure to cover these changes by change control procedures if instillation occurs after initial validation. Cleaning solutions ideal for Pharmaceutical labs. Primasonic’s acoustic cleaning equipment is suitable for processing medicinal products and meet the strict hygiene requirements that are expected of pharmaceutical firms. We can work with you to meet your individual company requirements following a full assessment of the environment of which the cleaning solution will be installed. Our acoustic cleaning solutions are gentle enough to ensure no damage occurs to delicate lab surfaces, while still being highly effective in removing leftover particulate residue. Installation also removes requirements of personnel having to enter the area to clean up the buildup themselves, further reducing the likelihood of contamination and maintaining higher hygiene standards. Ensure the quality of the next product is not compromised by leftover residue and reduce the risks of cross-contamination. Maintain the quality of the product produced and promote safety by fitting additional safety and cleaning measures. Spray drying is a common application within the Pharmaceutical industry. The specialised manufacturing technique is used for the formation and drying of pharmaceutical powder formations. Pharmaceutical labs are equipped with various types of spray dryers as different dryers produce different textures of particle powders depending on their specifications and measurements. These types of dryers are the areas that collect the most particulate buildup due to their nature and purpose. These formations build up as wall deposits by product attaching to the vessel walls before they are fully dry and sticking there. If these agglomerates continue to build up it can cause serious issues. 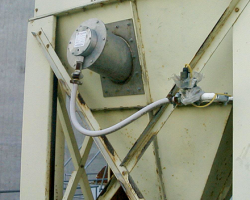 Having acoustic horns fitted within these spray dryers helps to remove the particulate buildup with the direction of powerful soundwaves targeting problem areas. After careful assessment, the horns are placed accordingly to maximise efficiency. 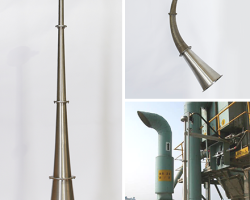 Acoustic horns in these industries are made with appropriate materials such as stainless steel due to high temperatures faced. Acoustic horns can also work as a preventative measure to avoid material buildup in future. Installing an acoustic cleaning solution within your dryers can improve production while reducing costs and removing the need to manually clean the dryer.